I have wanted to remodel my “ensuite” for awhile. “I have been watching too many HGTV shows.) I keep thinking about what I want and what can actually fit in the space. As I sit in my Italian rental apartment, I know what I’d really like. 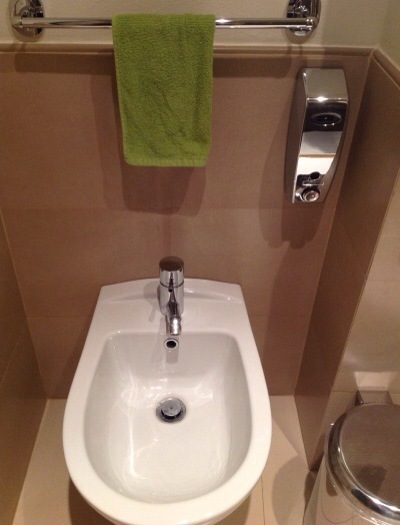 A bidet! This appliance invented by the French is such a handy fixture. We ran across a few in France, none in Scandinavia, and I don’t know anyone in the US who has one. They are very common in Italy. According to Wikipedia (Can you believe a librarian is quoting Wikipedia?) 97% of Italian households have them. They have been mandatory in Italy since 1975. So why not in the US? We could save on water. Why take a whole shower and dry up your skin when you can wash up the “lady parts” so easily? You can feel fresh in minutes!